Aaron Hicks celebrating one of his home runs in the dugout. @Yankees. When it comes to describing Sunday night's game, substitute Yankees ace Luis Severino for Sale, and Boston's bumbling $30-million-per-year albatross David Price for Gray, and you had a nearly identical score, as the Yankees rolled to an 11-1 victory. This was the Yankees' largest margin of victory against Boston since a 13-3 win in August 4, 2015 at The Stadium. With the win, the Yankees took two of three from the Sox in the weekend series, with he winning teams outscoring the losers, 30-2. The Yankees won 8-1 on Friday night before the 11-0 Boston win Saturday and 11-1 Yankee win Sunday. The Yankees, 54-27, take back first place in the American League East by percentage points over the 56-19 Red Sox, the 11th division lead change since May 7. Luis Severino was dazzling once again, as he threw 6 2/3 shutout innings, scattering just two hits and three walks, with six strikeouts, to earn his Major-League leading 13th win. No other pitcher has more than 11. Severino, with an overall record of 13-2, is already just one win away from his career high, which he set last season when he went 14-6. This was Severino's fourth straight win, and it was his sixth scoreless start of the season, including two straight and three of his last four. Severino lowered his American League-leading ERA to a superb 1.98, second in the Majors to the Mets' Jacob deGrom, who has a 1.84 ERA. One big difference between these two star New York pitchers is in the win department, as deGrom is just 5-4 on the season due to very little run support. 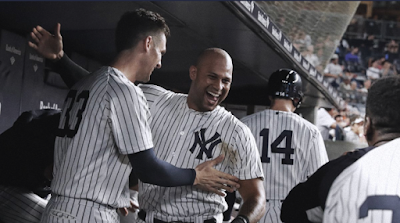 The Bronx Bombers were out in force on Sunday night, as they bashed a season-high six home runs, with five coming off Price, and three off the bat from Aaron Hicks. This was just the Yankees' second six-homer game since the start 2008, with the other one also coming against Boston on September 24, 2010. The Yankees wasted no time getting to Price, who they have owned since he joined Boston two years ago. In the second, Hicks hit his first homer of the night, a two-run shot to make it 6-0. In the fourth, Kyle Higashioka hit a rocket down the line in left field that just made it inside the foul pole and landed in the second deck. That was not just Higashioka's first career home run, but his first career hit. He is the first Yankee to homer for his first big league hit since Tyler Austin and Aaron Judge hit back-to-back HRs in their first career plate appearances on August 13, 2016 against Tampa Bay. He is the first Yankee to homer against Boston for his first MLB hit since Andy Phillips on September 26, 2004 at Fenway Park. The long homer snapped an 0-for-22 streak for Higashioka to start his career, the longest drought by a Yankee to start his career since Hal Reniff started 0-for-25 from 1961-64. Hicks followed that up with his second homer of the night, a solo shot, to make it 8-0. That was all for Price, who lasted just 3 1/3 innings, allowing eight runs on nine hits and no walks, with three strikeouts. The five home runs Price allowed was a new career high for him, as he his previous high for HR allowed was three, which he did six times. Price is now winless in his last five starts at Yankee Stadium, going 0-5 with an astronomical 10.44 ERA (29 ER in 25 IP), and is now 8-7 with a 4.75 ERA in his career at The Stadium. In the eighth, Hicks launched his third homer of the night, this one off Boston reliever Hector Velazquez, to right field to make it 10-0 at the time. This was Hicks' first career three home run game, and the first for a Yankee since Alex Rodriguez on July 25, 2015 at Minnesota. Hicks is the first Yankees leadoff hitter ever to hit three homers in a game, and just the 27th to do it in Major League history. When Hicks has been put in the leadoff spot, he has delivered in a big way this season. He has hit nine home runs in 18 games as a leadoff hitter this season, compared to five in 46 games in other spots in the batting order. Hicks is just the fourth player, and second Yankee, to hit three home runs in a game at the current Yankee Stadium, which opened in 2009. The only other Yankee to do it was Curtis Granderson on April 19, 2012, while Detroit's J.D. Martinez (now a member of the Red Sox) did it on July 21, 2015 and Kansas City's Lorenzo Cain did it on May 10, 2016. The Yankees reach the halfway point of the season at 54-27, including a major-league leading 31-12 (.721) at home. 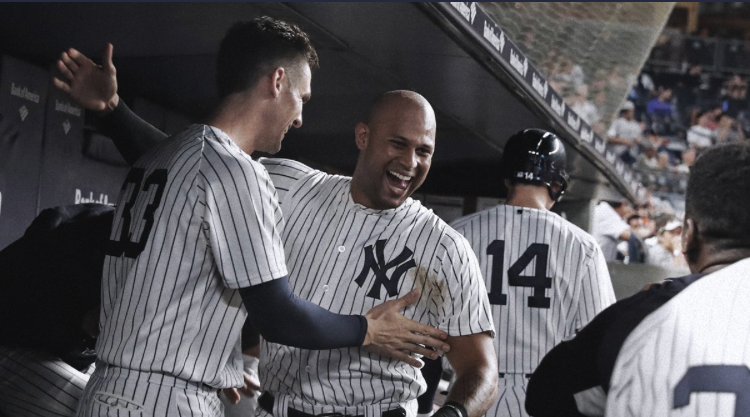 The Yankees face another top team on Monday night, as the National League East-leading Atlanta Braves visit The Bronx for a three-game set.